AcTrade” - “Account” and “Trade” – from lat. word “Accounting” and “Trade”). 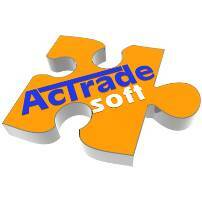 “AcTrade-Soft” company was established in 2009 to provide services in sphere of business automation, based on “1C” company software. The company was founded by a team of managers and programmers who have more than 10 years experience in business automation( since 1996). The company is an official partner of the"1C" firm . Company’s employees are certified professionals in working with the various components of "1C". Of course, the main activity of the company is the implementation and maintenance of 1C software product, but company's activities not limited to this. “AcTrade-Soft” company has created in Armenia the only Authorized Training Center, which offers the company's customers and all interested persons to learn the basics of computer literacy and working with software products of "1C" at the level of confident user. In 2010, the activity of the trade automation department was improved in target to implement the comprehensive supply and setting of computer equipment, shop equipment, automation software of pharmacies, bars, restaurants and entertainment centers. The company set as its goal to change the situation in the automation systems market for small and medium-sized businesses in Armenia(and abroad, including the Russian Federation).Company uses its own developments as well as innovative solutions in the modular systems of automation. Which in its turn allows significantly reduce development costs, simplify the process of the program implementation and training of employees, making the developed system exclusive by fully taking into account during the system developing already established technical processes of your business. In 2010, an improved and further developed in the business automation. The company has expanded its activities began offering commercial vehicles, introduction and management of local networks. In 2011, became the official and sole representative of the company “Soft Serve” in Armenia, which is well-known “Sales Work” software for mobile solutions. In 2012, for the good implementation, maintenance and sale of commercial vehicles. As well as the official implementer, known in the restaurant business software “Скатерть самобранка”. Datalogic. And also became the official regional technical center of company Datalogic in Armenia. In 2013 the successes gained in the business noticed a lot of foreign companies and suggested their partnership some of them “Scan City Latvia”, “A class”, “Z ben”, “Bizerba”, “Kaspersky”, “Sewoo”. We do not just sell Software Products. We sell ready-made solutions!! !